A closer look at the family left behind by the 41st president of the United States. When George HW Bush and Barbara Bush met while she was still in high school, they had no way of knowing that their romance would one day become a political dynasty. The Bushes, who hold the record as the longest married presidential couple, stayed together as George was elected to Congress, spent time in China as U.S. ambassador, headed up the CIA, became vice president and finally president, and for many, many years after. Along the journey, they had six children and 17 grandchildren (including three step-grandchildren), some of whom also went into politics: former President George W. Bush, former Florida Governor Jeb Bush and Texas Land Commissioner and grandson George P. Bush, who delivered a eulogy at Thursday's funeral. Among other notable offspring, to name a few: Jenna Bush Hager is a television personality, Pierce Bush is the CEO of Houston's Big Brothers Big Sisters organization and Lauren Bush Lauren is the founder of FEED Projects, a business and philanthropic company. 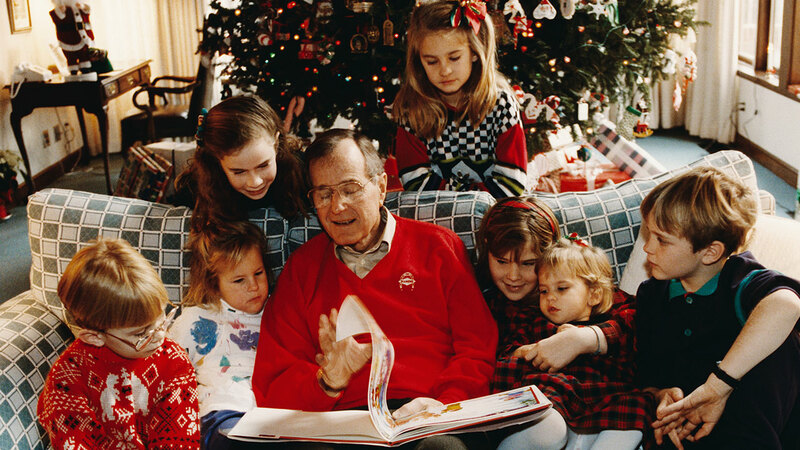 President George H. W. Bush reads to his grandchildren: Pierce, Marshall, Barbara, Lauren, Jenna, Ashley Bush, and Sam LeBlond at Camp David on Christmas Eve in 1991. Two of his grandchildren, Ashley Bush and Marshall Bush, remembered the 41st president on Good Morning America on Monday. "He was very grounded and certainly made us all feel very loved and made us feel very special," Ashley said. In this photograph released by the White House, President George W. Bush and family gather at Camp David for Christmas on Thursday, Dec. 25, 2008. Shown in the photo above: Seated front row, Lauren Bush, Ashley Bush, Ellie LeBlond, Gigi Koch, Elizabeth Andrews, Marshall Bush, Pace Andrews, Walker Bush. Second row, John E. Bush, George P. Bush, Barbara Bush, Pierce Bush, the late former President George H.W. 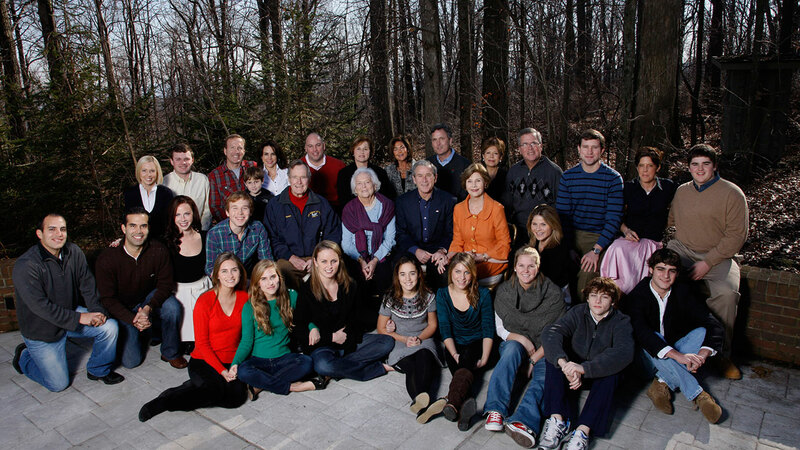 Bush, the late former first lady Barbara Bush, former President George W. Bush, former first lady Laura Bush, Jenna Hager, Top row, Mandi Bush, Sam LeBlond, Neil Bush, Ally Bush, Maria Bush, Bobby Koch, Doro Koch, Margaret Bush, Marvin Bush, Columba Bush, former Gov. Jeb Bush, Henry Hager, Noelle Bush, and Robert Koch. Marshall added that he taught them that "Family always comes first, and you do what you can to help the world." Born: He was born in 1946. Career: He was elected governor of Texas in 1994 and U.S. president in 2000, serving two terms in the White House. He also is a former managing general partner of Major League Baseball's Texas Rangers. Spouse: He married Laura Welch, a former teacher and librarian from Midland, Texas, in 1977. Children: They have twin daughters, Barbara Pierce Bush and Jenna Hager Bush, born in 1981. Barbara lives in New York and is the co-founder and CEO of the non-profit organization Global Health Corps. She got married in October in a small wedding in Maine so her grandfather could be present. Jenna is a national talk show host. Born in December 1949, she died Oct. 11, 1953, of leukemia. She is buried in College Station, Texas, on the grounds of the Bush Presidential Library at Texas A&M University. Born: He was born in 1953. Career: He is a former developer and investment banker, Florida commerce secretary and governor of Florida. Spouse: He married Columba Gallo in 1974. Children: They have three children. George Prescott, who is the eldest Bush grandchild, serves as Commissioner of the Texas General Land Office; Noelle Bush works in Florida; and John, also known as Jebby, or Jeb Bush Jr., serves as Managing Partner for Jeb Bush & Associates, LLC and President of Bush Realty, LLC. Born: He was born in 1955. Career: Neil is a founder of Ignite! Learning, an educational software company, and is board chairman of Points of Light, a public service nonprofit. Points of Light identifies him as president of ATX Oil and manager of Luoil, a project company. Spouse: He married Sharon Smith in 1980 and they divorced in 2003. In 2004, he married Maria Andrews. Children: Neil and Sharon have three children: Lauren, Pierce and Ashley. Lauren Bush Lauren is the CEO and Co-Founder of FEED Projects. She is also known for her previous career as a fashion model and designer. Pierce Bush is CEO of Big Brothers Big Sisters Lone Star. Neil's stepdaughter, Lizzie Andrews, attends medical school in Texas. Born: He was born in 1956. Career: He is co-founder and a managing partner of Winston Partners, a Virginia-based investment firm, and principal at the George W. Bush Presidential Library. Spouse: He married Margaret Conway Molster in 1981. Children: They had two children, daughter Marshall and son Charles Walker. Marshall is an event planner living in Texas. Born: She was born in 1959. Career: She is a board member of the Washington-based National Rehabilitation Hospital, where she once worked, and serves on the board of the Barbara Bush Foundation for Family Literacy. Spouse: She married William LeBlond in 1982. She and LeBlond divorced in 1990, and she married Robert "Bobby" Koch in 1992. Children: Doro and William have two children, Samuel and Nancy Ellis, known as "Ellie." Nancy Ellis LeBlond Sosa wrote George and Barbara Bush: A Great American Love Story in 2018. Doro and Bobby have two children, Gigi and Robert. Gigi is a recent college graduate.